 A new organization dedicated to finding homes for abandoned pet rabbits, Eastern Shore Rabbit Rescue and Education Center, Inc. (ESRREC), will hold an Open House in Rock Hall, MD from 1 to 4pm on Saturday, May 16. The public is invited not only to tour the shelter –located at 5718 Main Street –but also to celebrate with live music and children’s activities at the Gazebo in the center of town. Music will be provided by Buntopia, and activities will include facepainting; stations for coloring, art, and puzzles; and a bunny toy making workshop. “This is the first and only rabbit rescue on Maryland’s Eastern Shore, so we consider this worth celebrating,” said ESRREC President and co-founder Cora Dickson. The other founders are Taylor Pleasant of Rock Hall and Hallie Landon of Fairlee. ESRREC was established in December 2014 and was granted 501(c)(3) status from the IRS in March 2015, which means that donations will be tax-deductible. Because of the absence of rabbit rescues on this side of the Chesapeake Bay, ESRREC will serve five counties: Kent, Cecil, Queen Anne’s, Caroline, and Talbot. Rabbits are the third most popular house pet in the United States. However, regular animal shelters may not be an ideal environment for abandoned pet rabbits because of the stress encountered by being near barking dogs. Rabbits also require special care that many families do not know how to provide. As a result, shelters have difficulties finding adopters. Dickson explained that ESRREC’s dedicated shelter – with a capacity for 8-10 rabbits – aims to give the abandoned rabbits more specialized attention. Both foster homes and adopters will be screened carefully. ESRREC will also help educate adopters on rabbit care, and will hold “Bunny Care Basics” seminars around the region. As a charity, ESRREC will be relying on donations and fees to support its programs. To help raise funds to cover expenses –including rent, utilities, and veterinary bills — ESRREC is also opening a store within its building called “Usagi’s Place.” (Usagi is Japanese for “rabbit.”) It will feature bunny-related items, many of which are unique arts and crafts donated to ESRREC. A playpen for the rabbits will also be located inside the store, so that store visitors can get a glimpse of rabbits that are available for adoption. The hours for the store are Saturdays and Sundays 12-5 pm, starting May 9. More information about ESRREC can be found at www.esrrec.org. For media interview requests, please contact info@esrrec.org.